The Eco Sport is built for your next steps in new ad by GTB and Radical Media. 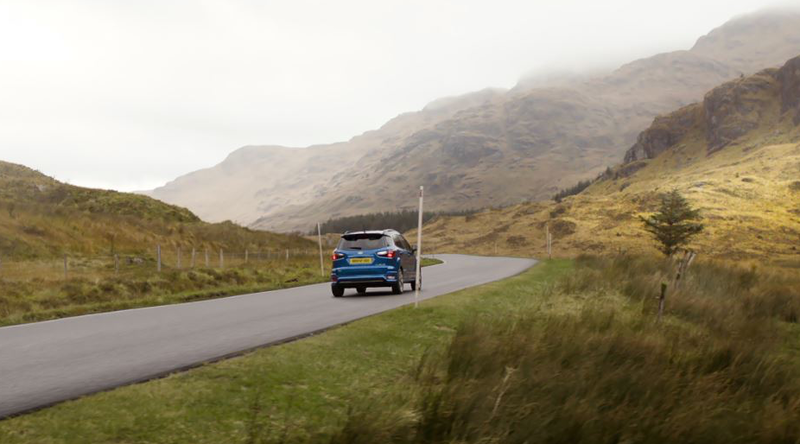 Ford take to Scotland to shoot cinematic new ad 'Built For Your Next Steps' to promote the EcoSport model. Created by GTB and produced by Radical Media and LS Productions, the 30" spot puts us in the shoes of the British public. Directed by Josh & Xander, the cinematic advert pays tribute to the narrative device used in classic movie scenes as the shot focuses on a character's foot as they step out of a vehicle to confront a challenge. In the advert the dramatic camera technique is adapted to introduce us to a cast of everyday British individuals. Identified only by their footwear, we see each anonymous character step gallantly out of their Ford EcoSport cars. As each character takes their next steps, the commercial shows a range of unique but sentimentally British journeys. LS Productions worked with Radical Media to source the stunning backdrops for each character's scenario. To visually articulate the unique, yet classically British storylines, LS Productions sourced a range of central, rural and coastal locations for the commercial from its wealth of Scottish locations. The film was shot entirely in Scotland over three-day tour of Glasgow's urban landscapes and Argyll's rural and coastal spots. Deva Smith, Producer at LS Productions comments: "It was great to be able to put together a nice, talented Scottish crew and to show our American directors the most diverse Scottish landscapes, from urban designs to rolling countryside and rugged terrain." The settings included the country's iconic rolling hills at Rest and be Thankful in the Scottish Highlands, scenes of the idyllic coastline were captured at Crinan Harbour and Glasgow's The Gorbals provided urban environments for inner-city shots. The production service company used a drone to film the ferry and coastal scenes. To pull off the shoot, LS Productions ensured full cooperation from Crinan Harbour's boatyard and its workers by halting boats from entering the area. Whilst the task of capturing scenes at sea presented some challenges for flying the drone, LS Productions helped to turn the location's unpredictable weather into a benefit for the film. Deva adds: "We took advantage of the changing weather, it added beautiful drama to the scene and the director was able to capture spray from the ocean waves." LS Productions sourced the use of a Scorpio Arm to capture the breath-taking shots of the vehicle driving down Rest and be Thankful - The A83 road which divides Glen Kinglas from Glen Croe. Commenting on working with Radical Media, Executive Producer at LS Productions, Sarah Drummond says: "We really enjoyed having Josh and Xander back over to Scotland. They love the diverse landscapes that Scotland has to offer, and they were super excited to get the chance to shoot here again. They really engaged with Scotland, it's people and its' landscapes, and for me it's always good to shoot something that doesn't have to be based specifically in Scotland. Our locations are stunning and can fit with most narratives, and even some you wouldn't expect." The film airs on TV and social channels from 18th January 2018.